Now that you’ve made the decision to share your life with that special person, how do you go about finding the perfect person to marry you? Your ceremony marks the beginning of your wedding celebrations, so you’ll want an officiant with charisma to set the right tone for the day. An initial consultation with a potential officiant is usually wise, especially if you’ve never met or seen him or her in action. Do we have a connection with this officiant? Are we comfortable in his or her presence? Is he or she responsive to our needs? Does he or she speak clearly and articulate well? Is he or she professional? Will you work with us to create a personalized ceremony and perhaps make suggestions? Will you ensure that the wording of the ceremony reflects our hopes, dreams and lives together? Will our guests be able to hear the ceremony? Will you be able to adjust if something unexpected happens during the ceremony? How have you have done so in the past? Do you have a track record of satisfied couples in the form of testimonials and references? Can we call on you any time before the ceremony if we have questions? How many times will we meet before the ceremony? Do you facilitate rehearsals? What do you do at the rehearsal? What is the rehearsal fee? Is there a contract to sign? Is there a deposit due and when? When is the balance of the fee payable? What time before the ceremony will you arrive? What happens if you are ill and cannot perform our ceremony? Do we have confidence in this person to legally join us together in matrimony? Will this person be the perfect gateway for such an awesome commitment? 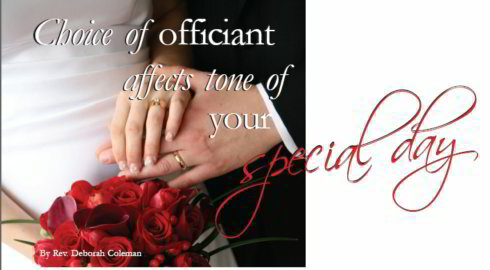 Once you find the perfect officiant for you, relax and enjoy the experience. If you’ve done your homework, all is likely to go well and you’ll look back on the ceremony as one of the richest, most meaningful parts of your special day. Rev. Deborah Coleman (Rev. Deb) has been performing civil, non-denominational, religious and spiritual services for many years. She has flare, a sense of humour, tons of patience and many creative ideas. You would be lucky to have her as your wedding day Officiant.